The artist's studio; 4th sale, Galerie Georges Petit, Paris, 2-4 July 1919, no. 169. Dr. Eugen and Adelheid Ziegler-Riggenbach, thence by descent to the present owner. favourites. The depiction of the woman intent on her leisurely movements after bathing attracted him both for its thematic and stylistic implications. The subject had a strong classical appeal: from the Greek Venus of Doidàlsas (III century B.C.) to Botticelli's Nascita di Venere, the woman emerging from her bath came to epitomise the éternel féminin in its most direct power of seduction. Degas, though, was first and foremost interested in exploring the stylistical chiasmo, the subtle tension between stretched and bent limbs - the left arm pulled out, while holding the cloth, the curve of the right arm continuing the pure line designed by the left shoulder. His portraits of bathers become, thence, a lucid reflection upon the harmonic contrast of forms and volumes, a modern reinterpretation of Greco-Roman classical statues of athletes, cleaning their bodies with their strigils after the victory. This reference to classicism has a very strong iconographic consequence: Degas clearly meant to celebrate his models, chosen from what R. Thompson calls 'les classes domestiques... celles qui remplissent les fonctions subalternes de la société, telles que servantes, modistes et peut-être même prostituées' ('Les poses chez Degas de 1875 à 1886: Lecture et signification', in Degas inédit, Paris, 1989, p. 222), elevating them to the high ranks of the noblest artistic tradition. 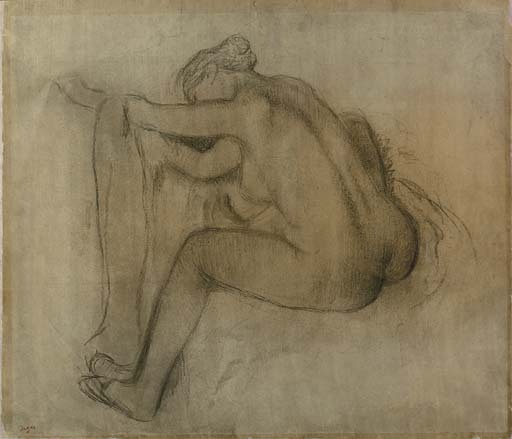 Between 1884 and 1895, Degas explored this subject in the most diverse media - from drawing, to pastel (fig. 1), to monotype and bronze (fig. 2) - changing his viewing point and perspective, whilst always confirming his obsession with this same gesture. It is definitely in the paper studies, however, that the artist achieves the most delicate nuances of intimacy, whilst flirting with obvious voyeurisme and a pervasive, yet extremely subtle, eroticism. Please note that the present work was included in the exhibition Europäische Meister at the Kunstmuseum Winterthur, June-July 1955, number 233.